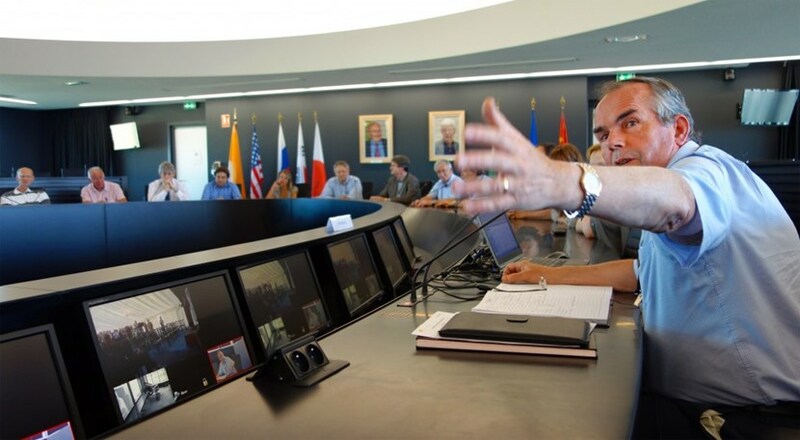 Some 25 former members of JET's staff gathered in the ITER Council Room, connected to Culham by video link. Thirty years ago, on 25 June 1983, the Joint European Torus (JET) came to life with a flash of plasma. "There was an air of hushed expectancy as the countdown for the first plasma attempt progressed," remembers Phil Morgan, then an optical spectroscopy specialist who had joined the project the year before. "A suppressed gasp was heard as on one of the TV screens the machine appeared to tilt when the magnetic field was switched on—then loud laughter as people realized that the field was distorting the image recorded by the TV camera." 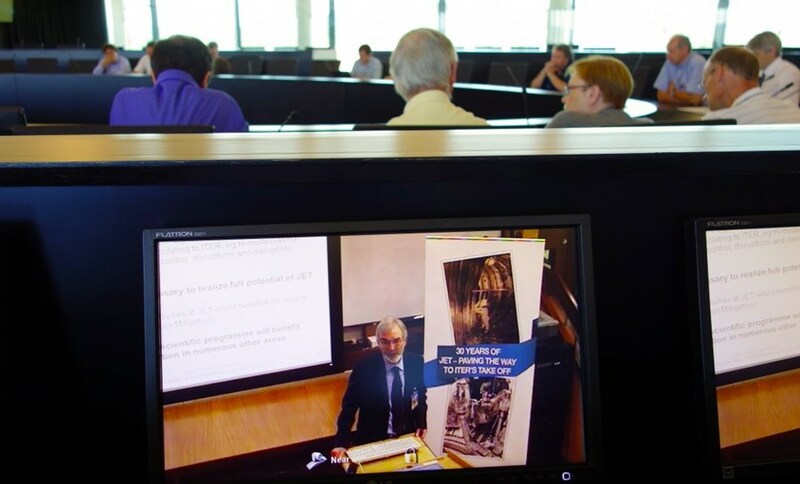 This anecdote and many others were shared on 24-25 June as JET and ITER personnel, connected by video link, assembled to commemorate the event that, 30 years ago, opened a new era in the history of fusion. 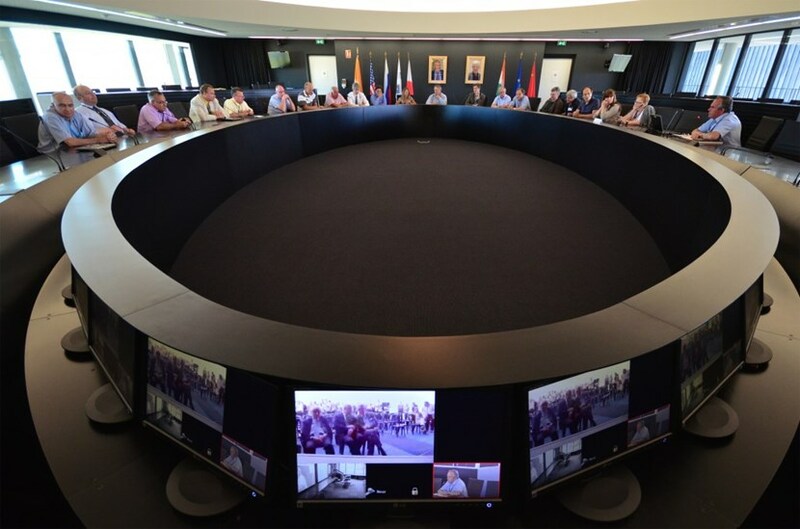 In the ITER Council Room, where some 25 former members of JET's staff had gathered around the head of ITER's CODAC, Heating & Diagnostics Directorate, Paul Thomas, and at Culham, where participants were hosted under a tent, participants remembered with equal emotion the intensity of the peak plasma current that was achieved on that day and the taste of the minestrone soup prepared by the wife of Franco Bombi, then head of JET's Control and Data Acquisition System. ''JET provides substantial training for those who will operate ITER,'' stressed David Campbell who made the trip to JET. 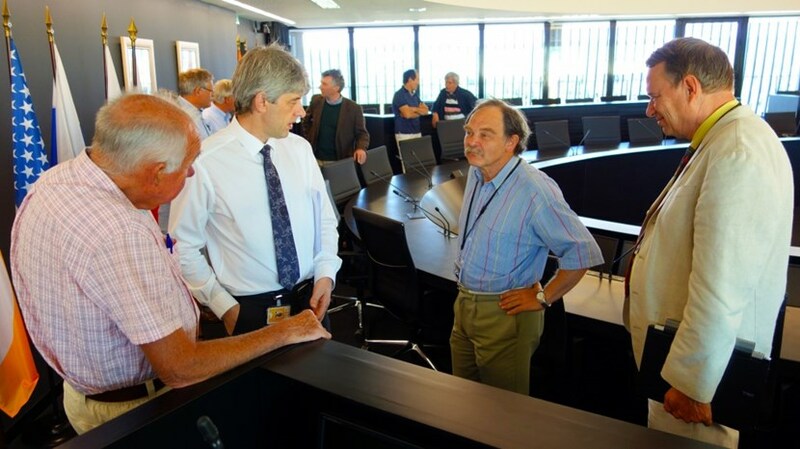 To Paul, and many others who now are part of the ITER team, JET provided "invaluable experience." Thirty years after its first plasma and two decades after its first burst of fusion power on 9 November 1991, "JET is the key device to resolve many of the challenges that we are facing," (Mike Walsh, head of Diagnostics); "Its input is critical for our commissioning plan," (Ken Blackler, head of Assembly & Operations); "It continues to deliver important results that provide direct input, even today, in our design decisions," (Günther Janeschitz, Engineering Officer). Two generations of JET alumni. From left to right: Physicist Peter Stott, who joined Culham Laboratory in 1966; Mike Walsh, ITER Diagnostic Division head; Ruggero Giannella, fusion physicist, European Commission; Günther Janeschitz, Engineering Officer who worked at JET from 1989 to 1994. The posters decorating the conference room at Culham for this two-day celebration read: "30 years of JET — Paving the way to ITER's take-off." ITER Director of Plasma Operation David Campbell, who made the trip to JET, stressed this important mission in his speech, broadcast live: "JET provides substantial training for those who will operate ITER." More coverage on the EFDA website.